This article is to be used only as a guide. Please check with your accountant before making any tax decisions or tax reporting. This article assumes that the landlord is a cash-basis taxpayer. Cash-basis taxpayers report income when received and expenses when paid. If you are a landlord, you will probably report your rental property taxes on a Form 1040, Schedule E.
-Rental Payments - Not only will you need to report money received for rental payments, but also the fair market value of any property your received in exchange for use of the rental property. -Uncollected Rent - A cash-basis taxpayer can not deduct uncollected rent as an expense. -Payments to Cancel Lease - If a tenant pays to cancel his/her lease, this money needs to be recorded as income on your taxes when you received it. -Security Deposit - A security deposit does not need to be recorded as income if you plan on returning it at the end of the lease. However, if you keep all or a portion of the security deposit due to tenant damages to the property, you will need to report this as rental income. If the security deposit is used as the final month's rent, you will need to report it as income when you receive it rather than as recording it during the final month of the lease. 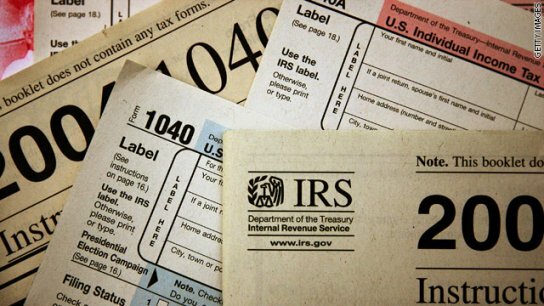 Keep in mind that a cash basis taxpayer records income when received. -Depreciation - For residential rental property placed into service after December 31, 1986, the depreciable life is 27.5 years. You can only deduct depreciation on the part of the property used for rental purposes. Land can not be used for depreciation on your taxes either. Therefore, when determining the depreciable value of your rental property, you will need to check with your county assessor to find out how much is land. For example, if you purchased rental property for $250,000 and your tax assessor assessed the value of the land for $50,000, then the rental property would only be valued at $200,000. The recovery period for rental property is 27.5 years, so you would divide the $200,000 by 27.5 years to get $7,272.73 as your annual depreciation. You can only begin depreciation of a rental property when it becomes available to tenants. For example, if you purchase a property in February, but the property is not made available to rent until July 1st, you can only record 6 months of depreciation on your taxes in that first year because the property was not made available until July 1st. -Repairs - Repair costs are also deductible on your taxes. -Improvements - Many improvements to the rental property are also deductible. -Operating Expenses - You may also deduct expenses that are related to operating your rental property on your taxes. Please be sure to contact your accountant before making any decisions or reporting related to rental property taxes.